TortoiseForum.org - Some great photos from Gerard Siatkoski showing off the unique looks of the Morenia petersi turtle. TortoiseForum.org - Gerard Siatkoski shares a neat video showing a lovely, mature albino box turtle enjoying a meal. 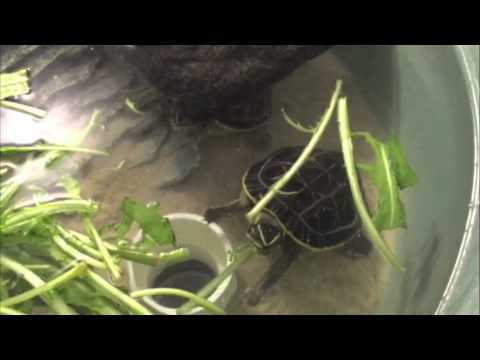 YouTube - Gerard, Conservation Husbandry Specialist for theTurtleRoom, shares footage of one of his beautiful and extremely rare Morenia petersi eating dandelion. Ball-Pythons.net - A sweet red-cheeked mud turtle peers up at the camera for a nice photo. TortoiseForum.org - Some very cute pictures of a baby loggerhead musk turtle swimming around and looking goofy. The Reptile Report - Enjoy this great photo of a handsome Kenyan sand boa from Matt Legg.